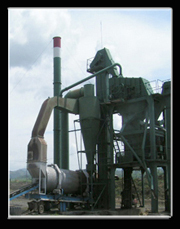 Our Tanaka TSAP 800 Asphalt Mixing Plant, intermittent type, produce quality hotmix with nominal capacity of 60 ton/ hour serving internal and external orders. This is equiped with complete and well maintained fleet including spreading and compacting equipment such as asphalt finisher, tandem roller and tire roller. All the work is carried out by skilled and trained operators and regularly controlled by lab technician ensuring that all orders are completed to the highest standard quality.